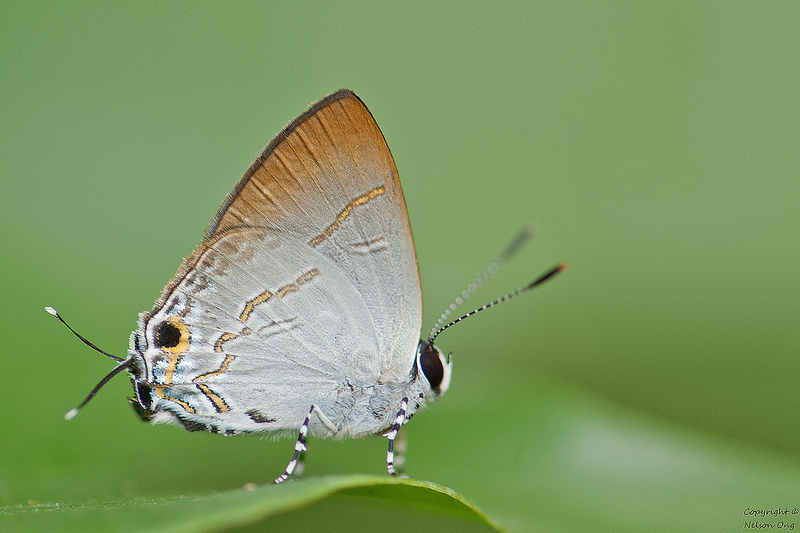 The Narrow Spark is a very small Lycaenid that was a new discovery to the Singapore Butterfly Fauna in the mid-90's. It was not recorded by the early authors but was first discovered in a patch of forested area in the Central Catchment Reserves adjacent to the reservoir. Subsequent to that, it has been regularly seen over the years, although not common, and its life history has been recorded in full. The butterfly prefers to remain in the shadiest understorey of the forests and is difficult to photograph as it is usually skittish. Here, ButterflyCircle member Nelson Ong gets an excellent shot of the Narrow Spark perched on the edge of a leaf.